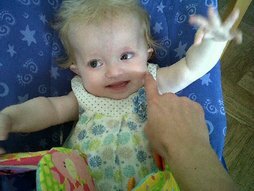 Faye was born in January 2010 with Malignant Infantile Osteopetrosis (MIOP). The pregnancy and birth were all normal and nothing was suspected until she was 8 weeks old. We began to suspect she couldn’t see and she constantly had a runny nose. We were eventually referred to the Bristol Eye Hospital where we were told she had delayed vision development. When Faye was 4 months old her head began to get very large very quickly. 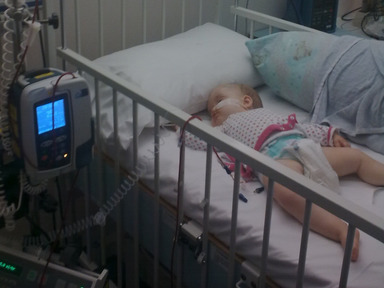 She was rushed into hospital where she had fluid drained from her skull. 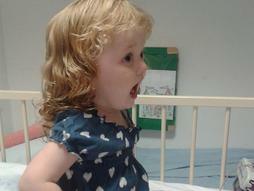 After many tests Faye was finally diagnosed at Bristol Children’s Hospital with MIOP. Fortunately, she was able to have a Bone Marrow Transplant and has now got 100% donor cells from an anonymous donor. 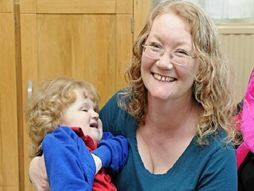 Faye is blind because her optic nerves were crushed by overgrown bone as she developed in the womb. She is now 5 years old and goes to a mainstream primary school. Her development is delayed but there is support in place to provide her with an excellent education and we believe that nothing is impossible. 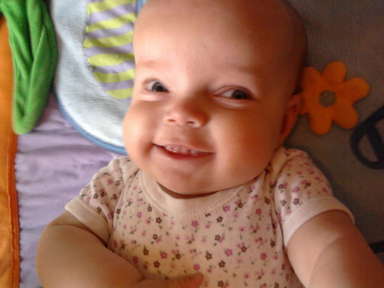 At about 8 weeks old we noticed Imogen's eyes were flickering and going cross eyed. When we mentioned this to the health visitor, she immediately got the doctor in. She was sent for scans as also her fontanelle wasn't quite right, and also saw an ophthalmologist. 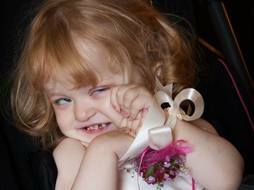 The scans showed nothing abnormal, but she was diagnosed with nystagmus. We saw a paediatrician every few months, and when she was 8 months old she had a blood test, and our Osteopetrosis journey began. 12th Jan 2011 we had the diagnosis at Bristol Childrens Hospital. A day we'll never forget. Both of us, and our eldest daughter, then 3, were tested to see if we were a match. The best was 9/10. There wasn't a 10/10 match, and due to Imogen's rare tissue type there were only two others that were 9/10. It was decided that her Father, Alex, would be the donor. 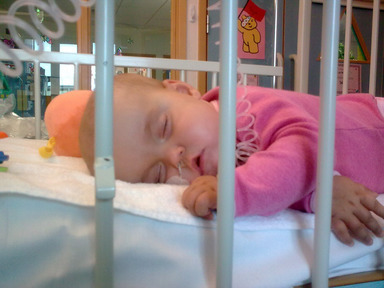 After several delays due to viruses, Imogen had her transplant September 2011 aged 18 months. It wasn't without its complications, but she was finally discharged in Jan 2012. Unfortunately, her level of donor cells declined slowly, and by Jan 2013, she was less than 5%. We made the decision to have another transplant. Luckily a donor was found who was a 10/10 match! 14th Jan 2014, she received the stem cells from a German female donor. 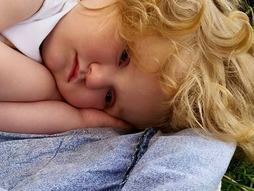 She suffered from GVHD. After 4.5 months we were discharged, but once again the donor cells started to decline. She had a few stem cell top ups, but it wasn't effective. It was decided that a DLI, donor lymphocyte infusion, would be the only option . Previously, the t cells had been taken out as bizarrely JimJams levels were high. DLI had then still in. 3 months later we finally had the news she was 100% donor. 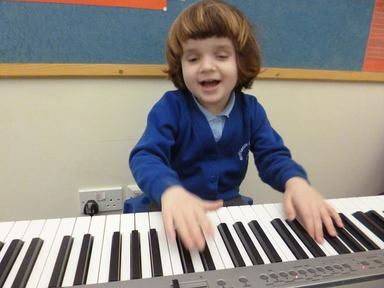 Imogen is totally blind, has moderate hearing loss and learning difficulties. At 5, she still isn't walking yet and is entirely tube fed. But what a happy little girl. Alex was born in 1993, my second son. His older brother, Matthew, then nearly three was delighted. During his first three months Alex’s weight gain was a little slow and he had continual snuffles. He then got a sticky eye. After several visits to our GP, Alex was thought to have an enlarged liver and spleen. The GP was concerned and said that there could be many causes for this including viral infections, blood disorders, etc. and we were admitted to Bristol Children’s Hospital where the Oncologist Consultant gave a provisional diagnosis of Malignant Infantile Osteopetrosis. He explained that Alex’s bones were “marbleising” as his bone marrow wasn’t functioning correctly. 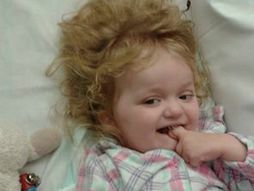 This was a rare genetic disorder but it was possibly curable. We were told that the only possible treatment was a bone marrow transplant (BMT). There was a much better chance of success if Matthew was a match and we were told that there was a 25% chance of that. If he wasn’t, it was possible we might find an alternative donor, possibly myself or Alex’s Father (Chris) or from the national panel of potential donors. BUT… if the procedure was successful, Alex would be cured. We were told that if a transplant wasn’t possible, the disease would progress and Alex would lose his sight and hearing, communication would become very difficult and then impossible. His brain would become cramped and damaged and he would be unable to fight infections. This would be because his bones would solidify and he would be unable to produce bone marrow. 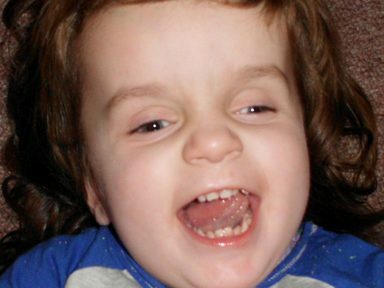 Without a transplant, he was likely to die before the age of 3. We were stunned at the severity of the condition and the poor chances of a cure. We went home. Over the following weeks, Alex had many x-rays and blood tests. We all had blood tests to determine HLA typing (whether one of us was a match for the BMT) and at last I was told that my two children were perfectly matched. This was the best news I had heard for a long time. Alex was over his first hurdle. Alex’s blood counts began to cause concern and he had a number of transfusions, both red cells and platelets. Some of these had to be carried out over long periods of time – because he was so small – and this meant staying in hospital. There were major risks with the BMT; it was possible that Alex could die during or soon after the transplant. However, the hospital was very positive and gave us lots of information. We were talked through the drugs Alex would be given and the possible side effects and the antidotes given to counteract them. We were upset to learn that Alex would probably be rendered infertile because of the drug regime. It seemed a daft thing to be upset about, as if that was all he had to worry about in 20 years time – at least he would be around! Alex had an ultrasound scan to ensure the major organs were healthy but this showed his right kidney was enlarged and blocked and also that his ureter was enlarged. He was injected with dye before special x-rays were taken showing his bladder and kidneys working. Alex obliged – all over the Radiographer! The results showed a definite blockage around the ureter on the right side. Alex had surgery the next week to take the kink out of the ureter and attach it to the bladder in the right place. (This was seen as incidental and not associated with the Osteopetrosis). Alex’s surgery lasted three hours. When we were allowed to see him, he was wearing an oxygen mask and had two drips – one a maintenance fluid, the other morphine. On the morning of Alex’s bone marrow transplant, Matthew had an operation to harvest his healthy bone marrow. Alex was in an isolation cubicle to protect him from infections. I had to change into sterilised clothes for the first time and observe isolation procedures. Matthew’s marrow arrived at the hospital mid-afternoon. I took a photo of the bag!! Matthew said, “That’s my blood going into Alex” and was very proud of himself. It was expected to take two weeks before a graft (when the new bone marrow is accepted by the new recipient) – it was going to be a long wait! Alex’s white blood cell count dropped to zero and stayed there. He was “up and down” for the next week or so, needing the Total Parental Nutrition (TPN) to keep him going. His mouth was sore and he was unable to feed normally. Then his blood counts started going up… then down… but the trend was up. His chest became wheezy and there was some concern that he had another chest infection. Alex became lethargic and tired. The doctors decided, nearly three weeks after the transplant, that he was fluid overloaded and that his lungs were full of fluid. All but essential fluids were stopped and diuretics were given by what seemed like the gallon. Alex didn’t improve, in fact he got worse. He couldn’t breathe easily and his temperature and blood pressure were high. He was transferred out of the BMT Unit and into Paediatric Intensive Care Unit (PICU). We knew this wasn’t a good sign, he was still extremely vulnerable to infections and he had to change out of a clean environment into one where other people with germs were likely to be. However, within 36 hours we were back in the isolation cubicle on BMT where, strangely, I felt “safer”. Alex’s white blood cell counts continued to rise as well as his other counts and his need for blood transfusions diminished. Alex left the BMT Unit less than six weeks after admission. What a wonderful and longed for day that was. Apart from a few minor hiccups, Alex’s recovery was remarkably good. He began to grow at a normal rate (although we were told he will never “catch-up”) and he has developed normally. He has no lasting sight or hearing problems. As for the future, the prognosis is very good. Whether his fertility was affected remains to be seen. He must take Penicillin daily incase his immune system was damaged by the chemotherapy and this may continue for life. Otherwise he is completely normal. He plays football, enjoyed school and has a very outgoing personality – we consider ourselves very lucky.